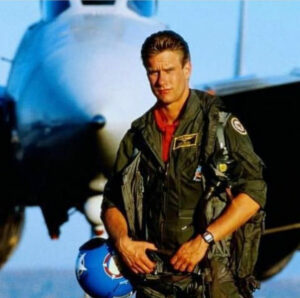 In 1986, Whip Hubley starred alongside Tom Cruise in the mega-hit action movie “Top Gun,” playing a young hotshot F-14 fighter pilot named Hollywood. 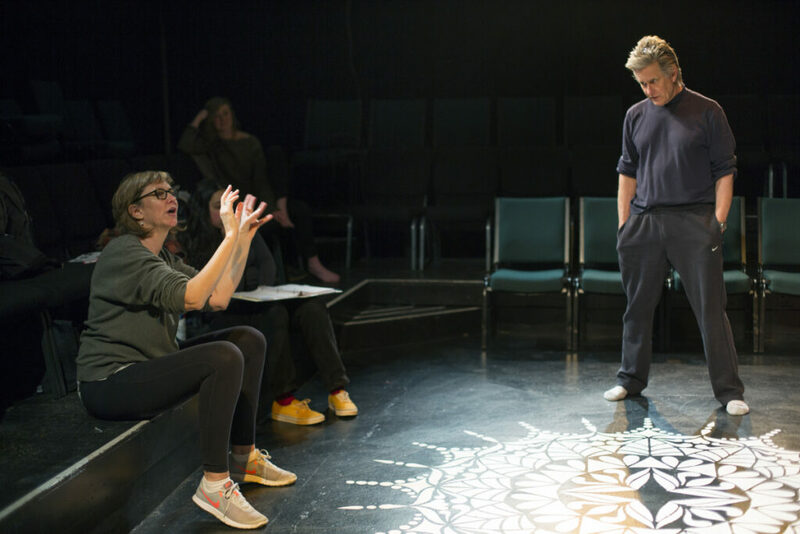 On Friday, the 61-year-old actor plays a humbly heroic stepfather named Aaron in a new play called “We Can Eat Love” in the 75-seat Studio Theater at Portland Stage. Hubley thought he was done with acting when he moved from California to Maine three years ago with his wife, Dinah Minot, the executive director of the arts agency Creative Portland. His last paid acting gig was in 2013, in a movie called “Drones,” and his last time on stage was in 2006, when he appeared in Harold Pinter’s “No Man’s Land” at the Lost Studio in Los Angeles. But he couldn’t resist the allure of live theater. 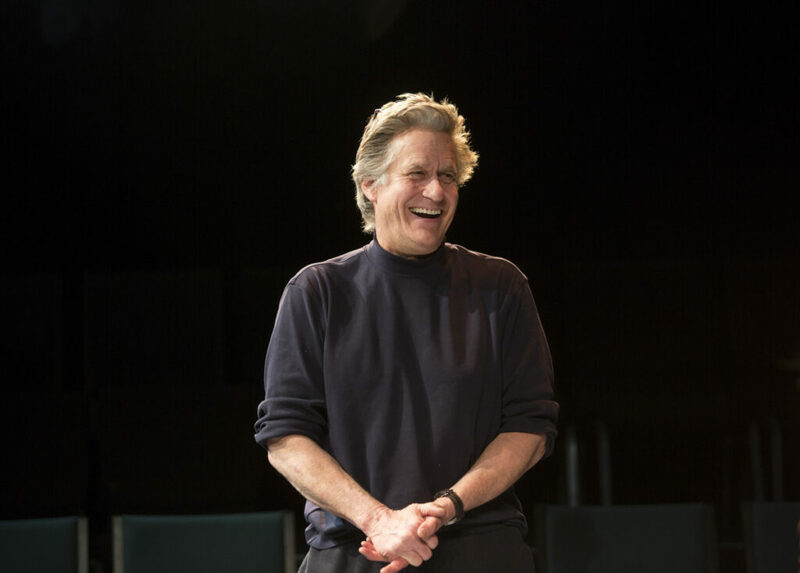 In performing in this taut family drama, the veteran actor is finding a level of emotional attachment to the material and a professional urge that he assumed he had left behind in Los Angeles. He kindled that fire in early 2017 when he participated in a staged reading of mystery stories by Maine writers at Portland Stage. He enjoyed the experience more than he thought he would. Hubley decided to take on this role because he liked Aaron’s character. He plays a 60-year-old stepfather in a complicated family dynamic and becomes a guiding force in the life of his stepson, Peter, played by Erik Moody. It’s an all-local cast. In addition to Hubley and Moody, it features Grace Bauer, Khalil LeSaldo and Casey Turner. The show runs for two weekends, through March 31. In the play, Peter gets kicked out of his band and moves home to live with his mom and stepfather. He’s working out grief associated with the recent death of his birth father and trying to figure out how his stepfather fits into his life. Aaron, a successful lawyer who is yearning for a personal awakening of his own, steps up and helps Peter find his way, but it’s a rocky road between them that involves fisticuffs. During rehearsal Monday night, a dental crown that had become loose earlier in the day popped out of Hubley’s mouth during the fracas. He put it back in and moved on with the rehearsal. Hubley was drawn to Margie Castleman’s script because it rang true in his own life. His father died in 1972, when Hubley was 15. Hubley had visited his father’s grave in Kentucky for the first time not long before he read the script. That experience was still stirring his soul when he began thinking about this role and what he could bring to the ensemble. Hubley and Minot, who live in South Portland, came east three years ago because they were empty-nesters and wanted to settle down in a place that felt like home. They have three kids who are in their 20s and independent. 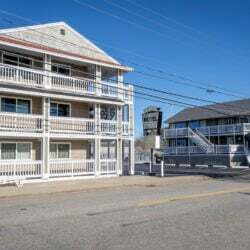 Minot grew up north of Boston and has deep family roots on North Haven. Hubley grew up in New York and learned to love Maine through annual trips to the midcoast island with the family. They met in 1977 when both were students at the University of Vermont. After tending bar and working on independent movie projects in New York, Hubley moved to L.A. for a role in William Hauptman’s play “Heat.” A lot of agents saw Hubley perform in that play, and the offers began rolling in. From 1985 to 1987, Hubley appeared in a string of hits, beginning with “St. Elmo’s Fire,” the TV miniseries “North and South, Book II,” “Top Gun” and “Russkies.” He played the lead in the latter, a Russian sailor named Mischa who washes up on the Florida coast during the Cold War. But it was “Top Gun” that made him a star. As Hollywood, he played the wingman to Val Kilmer’s Iceman and had a lot of screen time in high-intensity in-air sequences. It was directed by Tony Scott and became a commercial and cultural hit, setting the modern-day standard for fighter-jet action movies and earning its way into the National Film Registry in 2015. While Hubley was making his name as the fighter jet pilot Hollywood in Hollywood, Minot was working as co-producer and head of talent for “Saturday Night Live” in New York, eventually joining him in California. They married in 1988 and began raising their family. He did a lot of TV and a few plays over the years, and began focusing on other parts of his life when he noticed the entertainment business changing in the early 2000s, with the big-name actors getting top dollar and midlevel guys like Hubley getting squeezed. 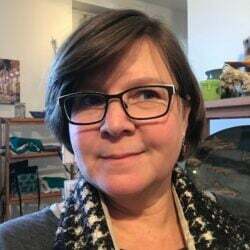 The director for “We Can Eat Love,” Eileen Phelan, said she sensed that Hubley still had enthusiasm for the art of acting when he participated in the staged reading of mystery stories in January 2017. She directed that event, as well. He didn’t put himself above the other actors, and expressed respect for the work and gratitude for the result, she said. Still, she didn’t think he would accept her offer to appear in this show. 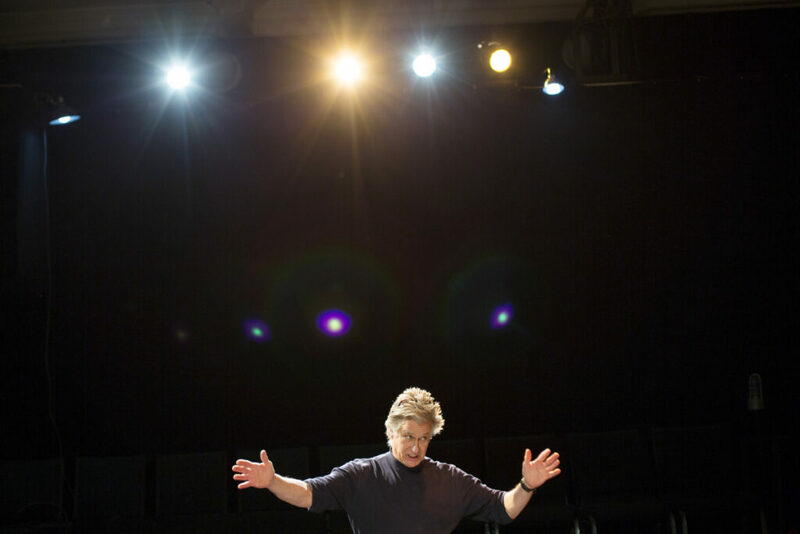 A staged production requires a much larger commitment of rehearsal and performance time than a staged reading. There’s risk involved and a shared buy-in with the other members of the ensemble. “But he did, and it’s a real gift to work with him,” Phelan said. It impressed her that “someone who has a rewarding film career in Los Angeles” would come to a new community, check his ego and do the excruciatingly hard work that’s necessary to launch a new play. The rehearsal process is arduous and cannot be compromised, she said. He showed some of those traits in rehearsal the other night, and not just when he reacted with grace when his crown came loose. This fight scene required repeated attempts, which meant a lot of wrestling, rolling around, getting back up and doing it again. A few times, Moody landed hard. “You OK?” he asked, leaning over to extend an arm and help his acting partner to his feet. Hubley is surprised how much work it’s been. He can handle learning his lines, remembering all the blocking and doing the preparation work necessary to make rehearsals productive. Harder is being mindful about balancing the work of acting with his day job. He works an eight-hour shift, shows up for four hours of rehearsal each night and returns home exhausted. With one exception, this is the first time Hubley has worked another job while also acting in a movie or play. The challenge for any actor is keeping focused and staying in character, on stage or off. The more distractions – family, work, outside stress – the harder it is to be good, he said. Hubley’s move to Maine represented an opportunity to shift quietly into the next phase of his life and nourish his love of carpentry and building. He learned to handle tools and take accurate measurements growing up in New York, where he did well in shop class – “straight As,” he said – and worked as a carpenter’s apprentice. He’s renovated houses throughout his life. The nature of carpentry work satisfies him in a similar way that acting does. Both tap his creative intuition, both require collaboration and both engender camaraderie. Occasionally, he misses the heyday of his movie career, and as he’s witnessed the industry morph again and open up to experienced actors like him with well-made movies and theatrical TV shows that are targeted for cable and on-demand audiences, sometimes those tinges of nostalgia mingle with regret about not sticking it out. But that doesn’t mean he wants to go back to being a star. He’s grown well beyond those years. His priorities and goals are different now.